The equipment takes the strong ultrasonic heads to release powerful ultrasonic, speedy vibrates fatiness cells, produces countless vacuum air pocket in and out of cells, mightily impacts the fatty cells, makes the cell membrane produce the inner cracking, so as to dissolve the triglyceride to be the glycirin and free fatty acid. Then then takes the power of RF wave with 0.5MHZ, to do deep-seated skin Diathermy, supply the skin oxygen and organic nutrition, strengthen cells function, advance the blood and lymph circulation, activate metabolism, remove and soften the cellulite, so get the body slimming and beauty effects. 1. Mightily cracking the cellulite, remove the fatness. 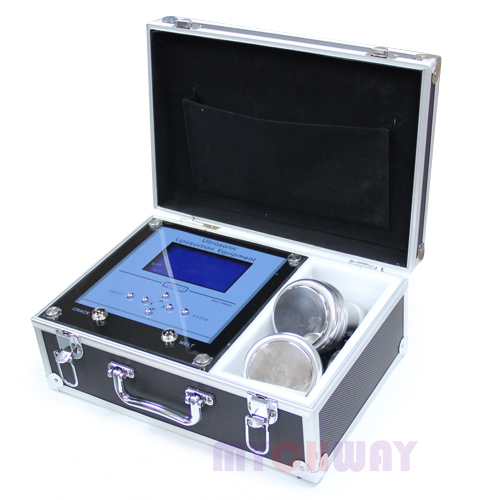 It uses the strong ultrasonic head to shoot ultrasonic, after entering the body, will make the fatty cells produce mighty cracking effect and fatty cells friction, effectively exhaust the heat energy, exhaust cells water, let fatty cells shrinking. Moreover, when the ultrasonic vibrates, there will bring mighty impaction among cells, fatty cells will be less, so get effect of fatness removal.